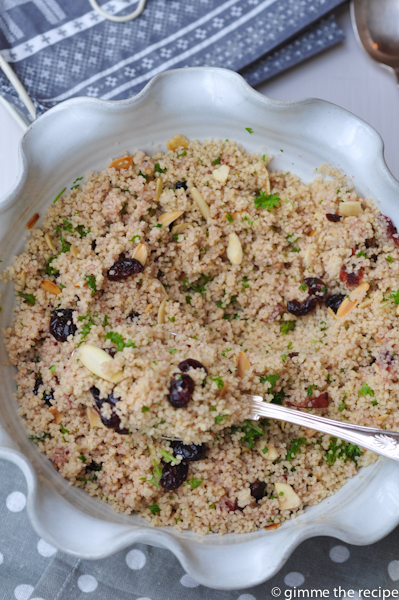 Having a bowl of flavoursome couscous on stand-by in the fridge over the Christmas holiday period is a very quick way of producing an emergency snack or meal. Add some salad leaves and some left-over cooked meat such as turkey, ham, spiced beef or whatever it is that you enjoy and spruce it up with a good old blob of cranberry sauce. 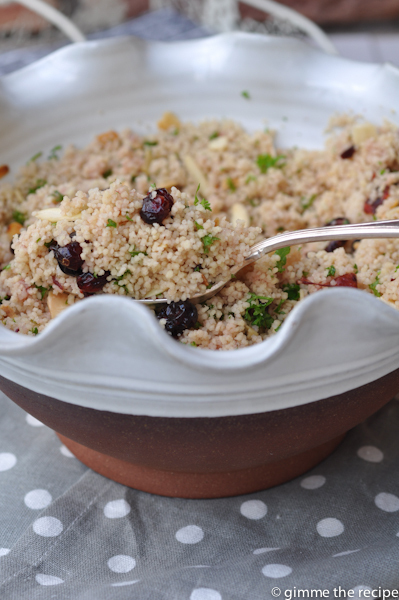 As in my recently posted winter salad the recipe itself makes good use of leftover cranberry sauce by heating it up in the microwave with some water – a great standby too for when you run out of gravy. The quantities here should yield about 8 generous portions and it’s so quick and easy to make you’ll have a bowl of this ready in less than 15 minutes. Lovely served either hot or cold. Heat the cranberry juice and water together in a saucepan – just bring to boil. Pour over the couscous and cover with a lid or clingfilm for 5 minutes. Meanwhile heat 1tbsp oil in a small frying pan, add the dried cranberries and mixed spice and stir together over medium heat until cranberries are warmed through and plumped up (2 mins). Dry-fry the flaked almonds in a small frying pan until lightly toasted (1 min). Rinse and finely chop the curly parsley. 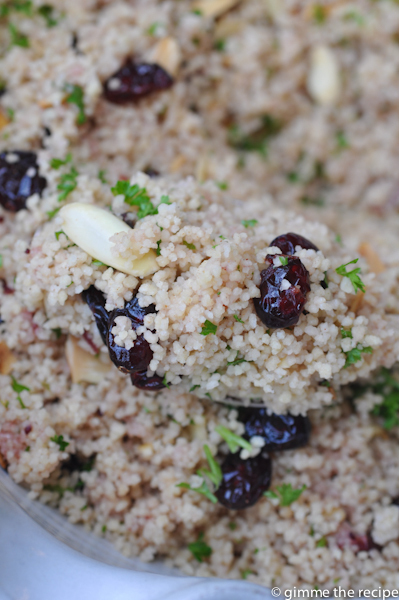 Remove the covering from the couscous and fluff it up with a fork. 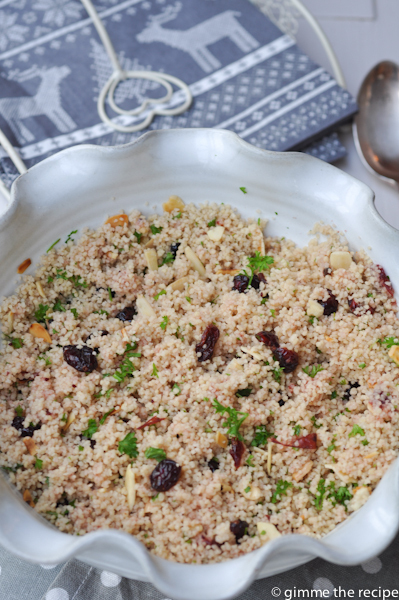 Stir in the cranberries, almonds and parsley. 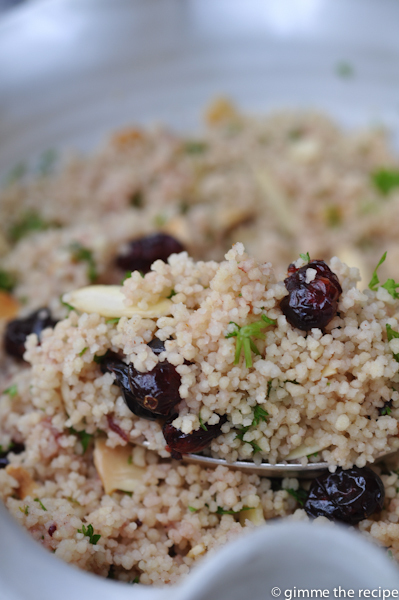 Heat 1 tbsp of cranberry sauce & 2 tbsp water together in the microwave (1 minute) and stir this into the couscous.